FENDI CAN EYE sunglasses – FENDI presents the protagonists of all-new Girl’s Secret short-cut movie by Rebecca Zlotowski featuring Sigrid Bouaziz. Inspired by a festive atmosphere and decorative opulence with a French touch, the CAN EYE sunglasses have a rigorous yet playful oversized square shape, making it feminine yet structured inclusive of stud details to add dynamism with a twist of colour. A word pun, “CAN EYE” plays on the dualism of the FENDI version of Marie Antoinette who is strict yet open to breaking rules. Femininity meets kawaii techno and an 18th century influence in the film which follows a night out of a contemporary “Queen of France”, who seems to hide a secret behind her sunglasses, wandering around Paris from sunset to dawn. Illuminated only by a few rays of light, she gets ready in her rococò private rooms, attentively choosing an outfit matching her CAN EYE sunglasses. The film takes us from Place des Victoires where she is surrounded by an entourage through the Parisian streets alive with festivity and vice, until reaching a neon bowling alley, where she enjoys a hedonistic and innocent evening with friends – all donning CAN EYE sunglasses. Directed by French film director and screenwriter Rebecca Zlotowski, it portrays the secret lifestyle of an ultra-modern Marie Antoinette – who inspired the FENDI Spring/Summer 2017 Collection – as interpreted by French actress Sigrid Bouaziz. The FENDI CAN EYE Sunglasses frames are inspired by the new Kan I bag. 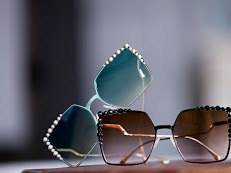 The two colour-contrast metal elements and the scalloped edges perfectly fit the candy-coloured studs, celebrating FENDI’s daring creativity and savoir-faire, while the palette recalls the sorbet tones of the Spring/Summer 2017 Women’s Collection which included aqua with pale pink studs and green shaded lenses, parrot with white studs and blue shaded lenses, peonia with mango studs and brown shaded/mirror silver lenses, black with black studs and brown/pink shaded gold mirror lenses. Born in Paris, Sigrid Bouaziz joined a modelling agency and worked for several fashion brands at age 15. An alumnus of the Conservatoire National Supérieur d’Art Dramatique de Paris (French National Academy of Dramatic Arts), she has worked with multiple international personalities. Moreover, the house of FENDI was established in 1925 by Adele and Edoardo Fendi, in Rome. The first boutique opened as a handbag shop and a fur workshop followed. Today, with multiple accolades, it is a renowned brand synonymous with quality, tradition, creativity and experimentation. In addition to this, FENDI sunglasses are produced and distributed by international Italian eyewear creator and distributor, Safilo Group which has a heritage in eyewear creations and manufacturing since 1878.